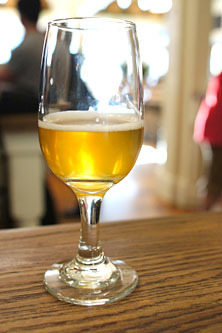 For the uninitiated, Bruery Provisions is the retail offshoot of the popular Bruery in Placentia, and focuses on the education and sales of beer, wine, cheese, and other gourmet goodies. 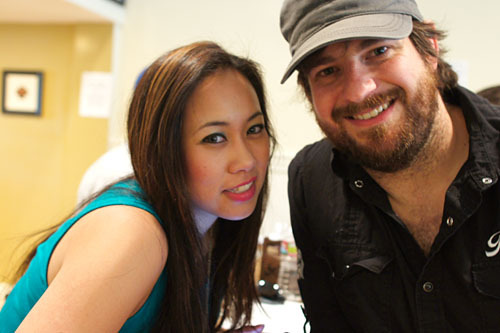 Back in January, I attended a beer and cheese tasting organized by local OC blogger Marian the Foodie. Given the success of that event, Marian hosted another tasting here, this time featuring the new sandwiches that Provisions will be serving. 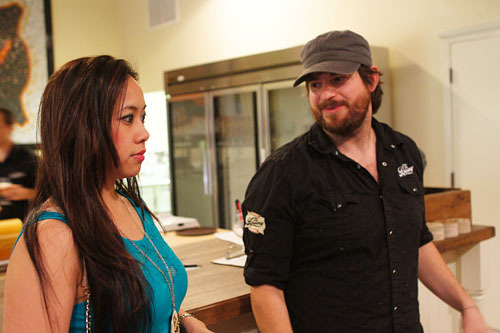 A quick introduction by Marian and Provisions' Staff Manager Jarred Dooley. 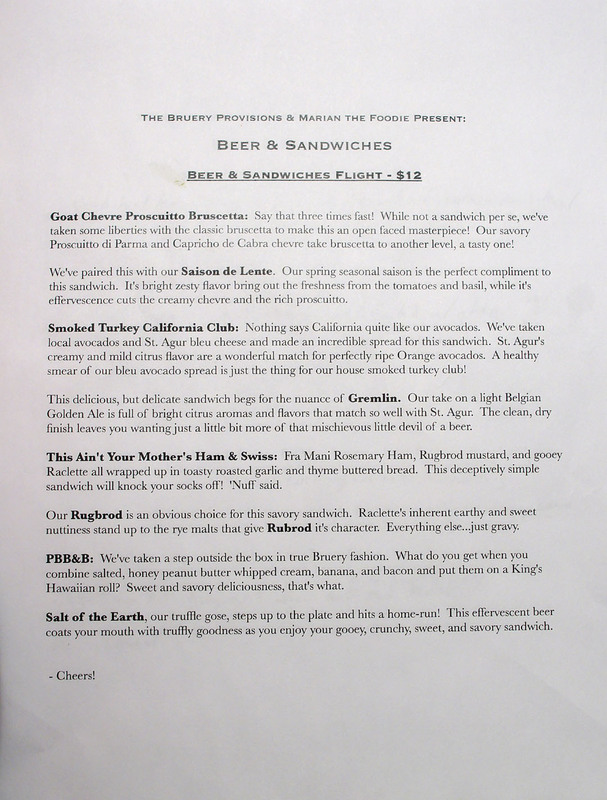 Four mini sammies and four paired beers--not a bad deal for $12. Click for a larger version. 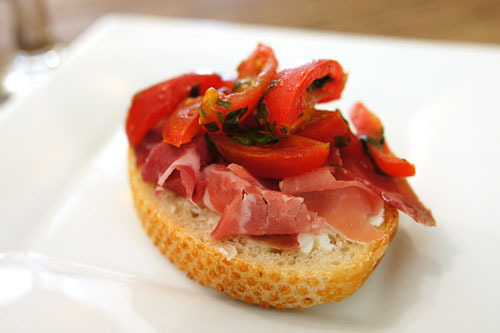 Goat Chevre Proscuitto Bruschetta: Say that three times fast! While not a sandwich per se, we've taken some liberties with the classic bruschetta to make this an open faced masterpiece! Our savory Prosciutto di Parma and Capricho de Cabra chevre take bruschetta to another level, a tasty one! We've paired this with our Saison de Lente. Our spring seasonal saison is the perfect complement to this sandwich. Its bright zesty flavors bring out the freshness from the tomatoes and basil, while its effervescence cuts the creamy chevre and the rich prosciutto. Our first "sandwich" brought us an Italian-style bruschetta. It showed off a classic interplay of flavors, with the sweet tomato and zesty basil accented by just a prick of lemon zest, all while the cheese provided a rich, creamy base to the dish. Tasty, but a bit difficult to eat. Meanwhile, I found the Saison a perfect pair to the bruschetta, with its marked spiciness playing beautifully with the overtones of basil present. Smoked Turkey California Club: Nothing says California quite like our avocados. We've taken local avocados and St. Agur bleu cheese and made an incredible spread for this sandwich. St. Agur's creamy and mild citrus flavor are a wonderful match for perfectly ripe Orange avocados. 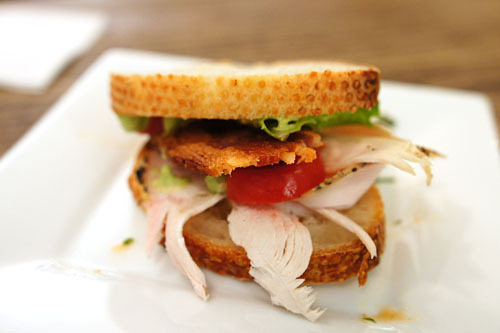 A healthy smear of our bleu avocado spread is just the thing for our house smoked turkey club! This delicious, but delicate sandwich begs for the nuance of Gremlin. 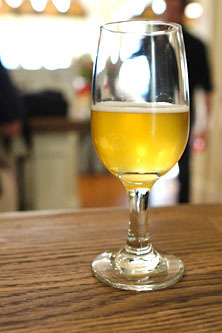 Our take on a light Belgian Golden Ale is full of bright citrus aromas and flavors that match so well with St. Agur. The clean, dry finish leaves you wanting just a little bit more of that mischievous little devil of a beer. Next up was Provisions' riff on the traditional club sandwich. The turkey was the star of the show here, tender and delicate, yet deftly augmented by the lusciousness of that wondrous avocado-Saint Agur combination. I also appreciated the inclusion of slow cooked bacon, which added a great pinch of salt to things while mixing things up texturally. Nice with the grassy, spicy, yet easy-drinking Gremlin. 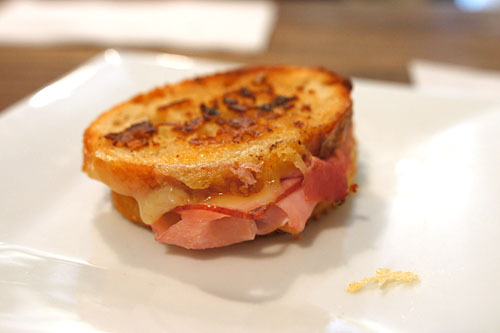 This Ain't Your Mother's Ham & Swiss: Fra Mani Rosemary Ham, Rugbrod mustard, and gooey Raclette all wrapped up in toasty roasted garlic and thyme buttered bread. This deceptively simple sandwich will knock your socks off! 'Nuff said. Our Rugbrod is an obvious choice for this savory sandwich. Raclette's inherent earthy and sweet nuttiness stand up to the rye malts that give Rugbrod its character. Everything else...just gravy. I think the Ham & Swiss was just about everybody's favorite sandwich, and for good reason. The interaction between the ham and cheese was faultless, but the key was the presence of rosemary and thyme. The slight astringency of the herbs provided the perfect accent to the dish, setting off the meat and cheese gorgeously. 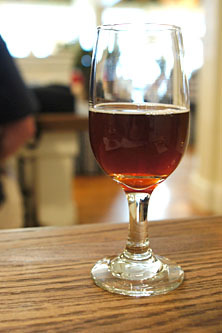 I also quite enjoyed the tangy Rugbrod mustard, which provided a linkage with the sweet, caramel-y beer. PBB&B: We've taken a step outside the box in true Bruery fashion. What do you get when you combine salted, honey peanut butter whipped cream, banana, and bacon and put them on a King's Hawaiian roll? Sweet and savory deliciousness, that's what. Salt of the Earth, our truffle gose, steps up to the plate and hits a home-run! This effervescent beer coats your mouth with truffly goodness as you enjoy your gooey, crunchy, sweet, and savory sandwich. Not being a fan of traditional PB&J, I wasn't terribly looking forward to Provisions' PBB&B. 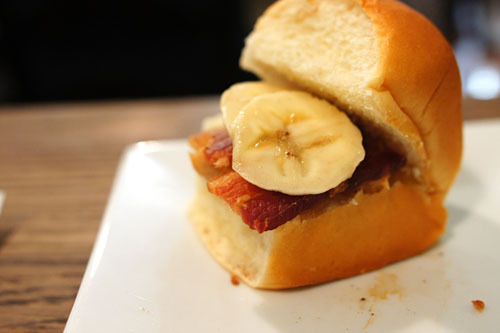 I found the sandwich to be a pleasant surprise though, with the countervailing sweet and savory flavors of the banana and bacon doing a great job in moderating the peanut butter. The spicy, truffle-y notes in the beer (which I seem to have forgotten to photograph) worked beautifully here as well. Another enjoyable event from Marian and The Bruery Provisions. The sandwiches will eventually be available in full-sized portions, and Jarred will be adding new variations to the menu as well. Finally, some "real" food at Provisions to go along with all that glorious beer! And I love Salt of the Earth -- the truffle is barely there, and the slight saltiness does play well with more savory fare. and while i am excited for their sammich offerings, not too excited about the influx of people the provisions will most likely experience...!!! HC: Wow, haven't heard from you in a while! Funny, we actually headed out to Bruxie after this meal. You been there yet? Ila: Where are you working these days? You moved restaurants right? Concur with Ila with the just-debuted Cuir, more like a fizzy aged port or sherry than a beer. Tasted it in my flight... then bought a bottle. Sounds like a plan! Do you ever head over to Haven then? Haven for me was just 'OK' - though that's just based on ordering 2 small dishes... I'm open to trying it again if someone else wants to go, but personally Provisions & Bruxie is my modus operandi there. I hear ya about Haven. You're not the first who I've heard describe the place as hit or miss. Speaking of Bruxie, we actually headed there after Provisions as well, and here's the post!